Jacob Ferree was the son of Isaac Ferree and Elizabeth Forbis and a nephew of Joel Ferree. Joel was a prominent gunsmith called upon during the Revolutionary War to manufacture rifles for the military. After the war he migrated westward, settled in an area along the Monongahela River, purchased land, "Ferree's Purchase", built a house, and set up a gunshop. Joel had a daughter, Rachael, who married Jacob Ferree, her first cousin. After the death of Rachael and his marriage to Alice Powell, Jacob sold his property in Lancaster County and with his family traveled west. They settled on the land of his uncle and former father-in-law on Peter's Creek in what would become Jefferson Township in Allegheny County, Pennsylvania. 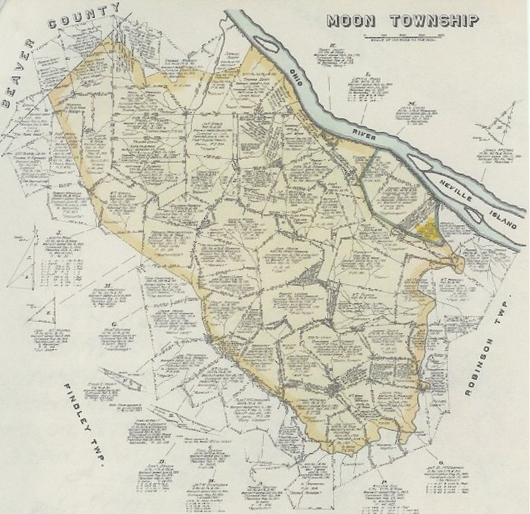 Around 1800 Jacob purchased a tract of land of about 331 acres in Moon Township paying $2,850.15. In the Fall of that year he and his sons built a house and the family moved the following spring. He also built a gunshop to manufacture rifles and gun powder. It was on this property that Joel Ferree died in 1801. There is a Ferree family tradition that soon after the move, Joel was visiting Jacob, saw a deer and went hunting. When he did not return the family went searching and found he had been killed and scalped by Indians. His will stated Jacob was to be given the tract of land on Peters Creek (300 acres). Upon Jacob's death the land was to pass on to the grandchildren, Joel, Rebecca, Jane, and Elizabeth, the four children of Rachael by Jacob. Jacob Ferree received a patent for his land on May 17, 1804. It was known as "Britania" and located in what is now Coraopolis, Allegheny County, Pennsylvania. Jacob Ferree died September 5, 1807. This obituary appeared in the Pittsburgh Gazette. Jacob Ferree, Allegheny County, Mifflintown. Tuesday, September 8, 1807. At his farm on Saturday last in Montiers Bottoms, Mr. Jacob Ferree in the 57th year of age. His remains were buried the day following attended by a number of friends, relatives, and acquaintances. As a man, Mr. Ferree was greatly respected, his strict integrity and obliging manner endeared him to all acquaintances. He was pious and devout Christian and died in the full belief that through the merits of his blessed Redeemer he should enjoy a happy eternity. 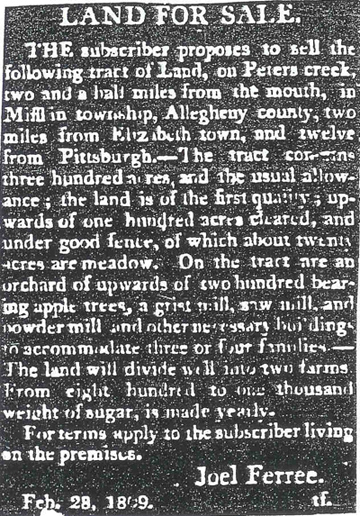 This advertisement in the Pittsburgh Gazette was for sale of Jacob Ferree's land by son, Joel. Jacob Ferree the son of Isaac Ferree and Elizabeth Forbis was born August 8, 1750 and died September 5, 1807. Lineage: Jacob Ferree and Rachael Ferree, Alice Powell/Isaac Ferree and Elizabeth Forbis/Philip Ferree and Leah Dubois/Daniel Ferree and Marie Warenbur. 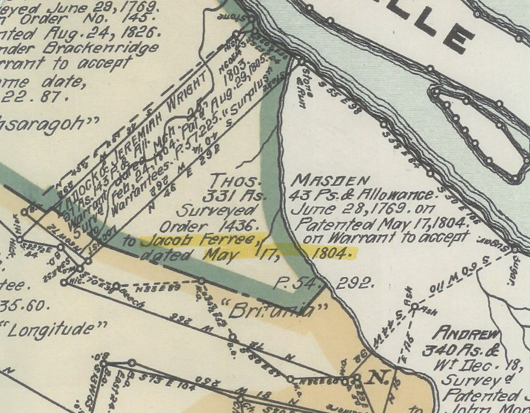 Source: "Historic Pittsburgh - Western Pennsylvania" ; "Historic Pittsburgh Warrantee Atlas, Plate 26 - Moon Township" University of Pittsburgh Digital Library at http://digital.library.pitt.edu; Lancaster County Pennsylvania Will Book H, page 95; "Ferree Family Gunsmiths" by George Bennett Ferree.